We are pleased to offer an online Hebrew school for the Jewish children in our community who aren't able to attend one in person. 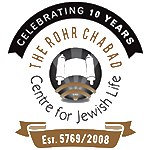 The program is managed by a department of Chabad's HQ in New York, and we are happy to speak with you about any questions you may have. Click here to learn more about the online Hebrew school and to register your children.